Dave encourages travelers to get out of their comfort zones and try new things. Dave Fox is a best-selling humor and travel author, radio host, lively public speaker and storyteller, and a passionate writing/humor coach. Originally from the United States, he has traveled in nearly 60 countries on five continents. He has lived in England, Turkey, Norway, and Singapore, and speaks fluent Norwegian. Since 2015, has been based in Ho Chi Minh City, Vietnam. Dave got his start in travel journaling at age seven, when his family moved to England. They traveled around Europe and North Africa during their year abroad. Whenever they left home, Dave would scribble stories about his experiences in a big, red book he carried with him. He has been writing about his travels ever since, and teaching others how to write about their own travels for more than two decades. His books, Globejotting: How to Write Extraordinary Travel Journals (and still have time to enjoy your trip!) and Getting Lost: Mishaps of an Accidental Nomad, have both been Amazon travel bestsellers. Getting Lost, his collection of humorous travel tales, was also designated as a “New and Notable” book on Amazon when it was first published. Dave is currently writing his third book, The Ghosts of Bùi Viện Street, about the people who live and work in Ho Chi Minh City’s budget traveler ghetto, and the stories beneath the surface that tourists miss when they pass through the neighborhood. Dave’s innovative approach to travel storytelling has been featured on Channel NewsAsia and ABC Radio in Australia. His travel journaling workshops have been recommended in the Wall Street Journal. He has also been profiled on the History Channel program, “Weird U.S.,” for his knowledge of cultural contrasts between Norwegians and Norwegian-Americans. 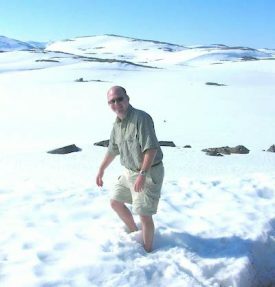 He hosts the twice-monthly Globejotting Travel Show on Expat Radio. In 2005, he was invited to be the opening speaker for Princess Märtha Louise of Norway on her book tour stop in Edmonds, Washington, near Seattle. You can also read Dave’s more extensive media bio here.